Hey everyone. Busy weekend, so I’m getting this post off late. 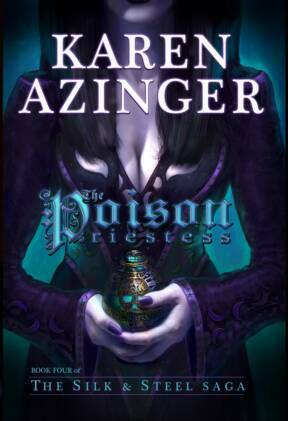 I started reading Poison Priestess, the 4th book in Karen Azinger’s Silk and Steel Saga. While it is pretty gripping, right now, it’s all villains, all the time (almost). The last book left the minor villains behind and focused on the Mordant–who is the major villain–and the heroes, with just a few updates on the small fry. At the time, that was just fine with me. Now, however, there has been fourteen straight chapters of three villains, interspersed with occasional chapters of the beleaguered queen, Liandra. I don’t read heroic fantasy to read only about villains, so I’m hoping this changes soon. Although I have little hope of either of these young women reading this post, I wanted to offer my congratulations to Captain Kristen Griest and First Leiutenant Shaye Haver of the U. S. Army for making it through Ranger School. I always felt that there was a certain percentage of women who could equal the physical strength and endurance of a man, and they have now proven it. When I joined the Air Force, I wasn’t exactly gung-ho, but I was a little affronted at the physical standards. I started Basic Training at a physical fitness level that I thought was the basic qualifications for getting into Basic Training. Once I joined, I learned that they were the qualifications for graduating, not for joining. And they assumed that we would have to work up to that level. This is basic high-school fitness, guys. The ability to run two miles without stopping, do twenty or so sit-ups and the same number of push-ups, to lift fifty pounds. Anyone who was in reasonably good shape could have done it, so I guess that was all they were looking for. Not one of us washed out for failing to meet those standards–not even the ones who were slightly overweight. Since any average day in high school cross country was much more challenging, I always felt I could have easily met the men’s standard–even the fifty sit-ups. So the fact that these two Ranger graduates met much tougher male standards makes me very happy for them. I have another Time Trip post I’m planning for sometime this week–probably Wednesday. I hope you enjoy it! Thanks for the warning about the mostly-villains book. I normally have trouble getting interested in villains. Either they’re too nasty for me to want to read about, or the humanizing elements make it hard to see them as proper villains. I saw a gal done in a way that held my interest without making me question whether she was a bad guy worth fighting against and even wishing she’d lose, and there might have been other occasions I remember less clearly. So it can be done, but… not many pull it off right for me. I bet she was very cool to talk to. I knew a few former WACs (Woman’s Air Corps) when I was in the Air Force, and they weren’t nearly so old. The series is still very good so for me, I think the book will still be worth the reading. When I do my final review, I’ll let you know if I think it would be OK to skip it. Too much villainy- that was what ruined `The Outcast of Redwall’ for me. I don’t mind spending a bit of time with the bad guys if their interesting and it builds suspense, but they shouldn’t take over the book! For me, being in the bad guy’s heads doesn’t build very much suspense. In this book, one of the chapters ended up at a cliffhanger where the priestess was in danger of losing her life. For a hero, this works. But for a villain, I wanted her to die, so I was rooting for those who were trying to kill her. Alas, they did not succeed. Now if the author had set the priestess against a hero, that would have been more compelling. But the guy she was trying to kill (did I mention that?) was a villain as well. So–oh well.